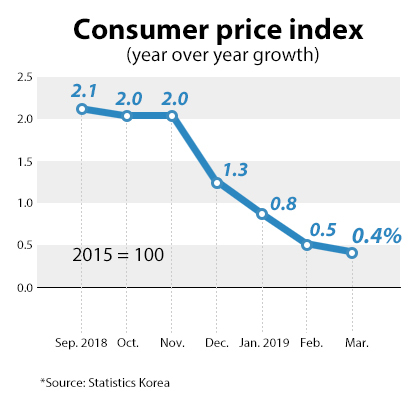 South Korea’s headline inflation stayed below 1.0 percent for the third consecutive month in March, showing the weakest for the first quarter since quarterly data became available from 1965, as softening oil prices coupled stubbornly sluggish domestic demand. 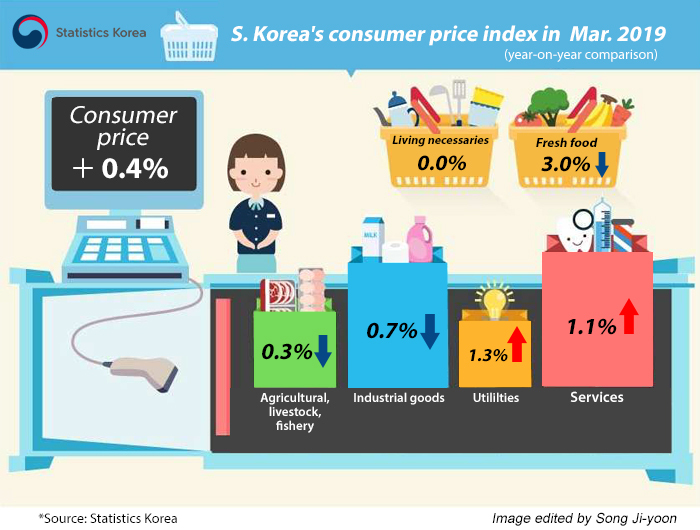 According to Statistics Korea on Tuesday, the country’s consumer price index (CPI) in March added 0.4 percent from a year ago after a 0.5 percent gain in the previous month. The last time price gain was so weak was in July 1999 with a 0.3 percent rise amidst recession following the 1997-1998 financial crisis. The CPI in January to March period grew 0.5 percent on year, the slowest since the quarterly data kept a record in 1965. Protracted weak inflation accompanying a slow-motion growth is a dangerous recipe for a recession, building up a market rationale for more aggressive policy to prop up the economy including a cut in the policy rate. Bank of Korea Governor Lee Ju-yeol on Monday reiterated that it was too early to lower the benchmark rate. The BOK’s next rate decision meeting is scheduled on April 18. Prices of petroleum products plunged 9.6 percent, dragging down the headline inflation by 0.43 percentage point, according to data. Vegetable prices plummeted 12.9 percent to knock off 0.21 percentage point from the headline CPI. Service charges were up a mere 1.1 percent, lifting the CPI by 0.58 percentage point. The growth was the slowest in more than five years since February 2014. The statistics bureau said the subdued prices of petroleum products caused by softening global crude prices and the cut in domestic fuel taxes were the biggest factor for the slow inflation last month, together with increased vegetable supplies amid favorable weather conditions and slowdown in service price growth. Core inflation, which excludes volatile oil and agricultural goods, rose 0.9 percent from a year earlier, also slowing from 1.3 percent in February. The CPI that strips out food and energy categories, the standard of the Organization for Economic Cooperation and Development (OECD), edged up 0.8 percent. The index for everyday expenses reflecting spending for stable food and utility fees remained on par with the same month a year ago. The market has added pressure on policymakers with its bet on a lowered rate, with the three-year government bond yielding at 1.727 percent, below the policy rate of 1.75 percent.